Over 6000 fixed wing aircraft were built at Yeovil between 1915 and 1955. The first practical helicopters had appeared towards the end of the war in Germany and USA, one of the most successful American designers being Sikorsky. In 1946 Westland negotiated a long term agreement to build Sikorsky designs under licence, but they also made the bold policy decision to specialise in helicopter designs for the future. The introduction of helicopters into the Royal Navy was to transform Naval Aviation. The use of helicopters equipped with dipping sonar superseded fixed wing aircraft in the anti-submarine role while helicopters brought a whole new dimension to search and rescue. It must not be assumed that Westland simply built off the shelf designs under licence. In all cases the Westland versions were subject to re-design and incorporated many improvements. Later Whirlwinds were re-engined with gas-turbines and the Wessex included a very advanced autopilot, setting the highest standards in the anti-submarine role. The result was a period of re-organisation where many of the companies combined to form only two major aircraft manufacturing groups (The British Aircraft Corporation and the Hawker Siddeley Group), neither of which had retained any interest in rotorcraft. Because of its success in the helicopter business, Westland were well placed to take the lead for rotary winged aircraft, there followed a period when Westland acquired Bristol Helicopters, Fairey Aviation and Saunders-Roe to become Westland Helicopters, Britain's sole helicopter company with full order books for Wessex, Scout and Wasp. The partnership with Sikorsky continued with the adoption of the SH-3D to produce the Sea King. At the same time the British forces requirement for a range of new helicopters was met by collaboration with the French company, Aerospatiale to produce three new designs, Puma, Gazelle and Lynx. 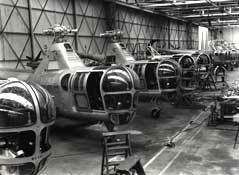 Westland were to take design leadership for the Lynx, while Aerospatiale were to be responsible for Puma and Gazelle. Both companies were to take part in the development and manufacture of all the aircraft. The Anglo-French Helicopter Package Deal represented a major step in the development of Westland within the European aircraft industry. There followed a period of unprecedented prosperity for Westland, the Lynx was a great success, setting a new high standard for small ship operations with Westland becoming the world leader in this field. A substantial number of Pumas and Gazelles were on order for the British services, while Sea King was doing well in the export market. COPYRIGHT © and all other RIGHTS in these pages are reserved by AGUSTAWESTLAND LIMITED.